The Doe Club was founded in 1968 with 28 members. As of February 2016 membership is at 150. 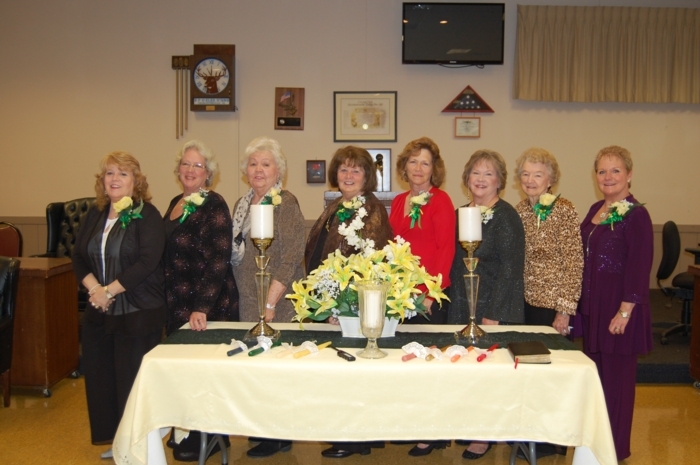 The mission of the Doe Club is to promote the civic and cultural welfare of the community, fellowship with members, and to assist the Elks in carrying out their service to the community. Co-sponsor for the annual car show. The Does raise money through raffles, bake sales, craft fair, cook book sales and by running the Bingo concession each Wednesday night. Our meetings are held on the first Thursday of each month except April, July, August and October. During these months, our meetings are on the third Thursday. Dinner is offered to the Elks and the Does before our respective meetings. Annual dues are $25.00 payable in April. There is a one-time initiation fee of $20.00 with your application. You receive your own name badge and key card which allows you access to the Lodge. The Does are a worthy benevolent club. L to R: Rita Glass, Judy Brochu-Blake, Anne Bonderant, Delores Lushbaugh, Pam Thomas-Hicks, Vickie Thomas, Thelma Crenshaw, Kaye Frazier-Campbell.